Yes, i have to agree with both of you girls. He's just like his late father, he even drop of school just like him. i cannot stop wondering what must P. Caroline feels everytime she see the resemblance between her youngest son and her unforgettable late husband. As announced last week Pierre has participated in the 16th Monte-Carlo Historical Rallye on January 27, 2013. His girlfriend Beatrice and Prince Albert were present as well. 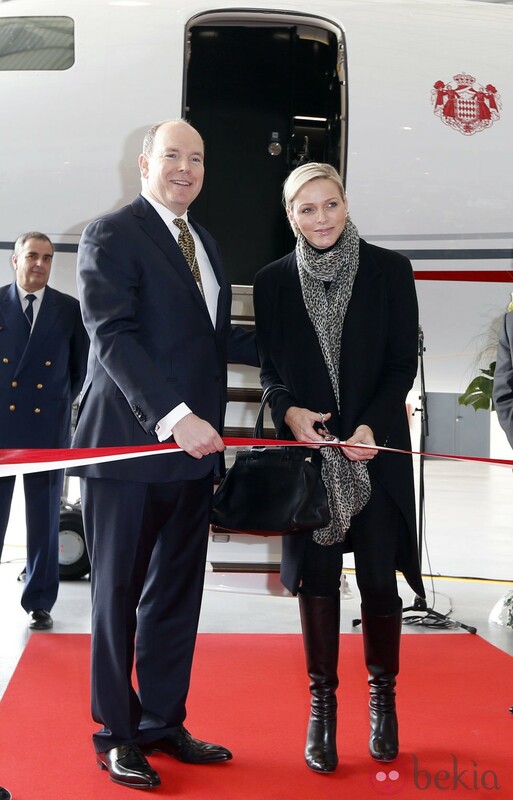 Prince Albert, Princess Charlene, Princess Caroline and Pierre Casiraghi attended the presentation of the Monegasque Princely family's new "Falcon 7X" plane and its hangar at Nice airport today, March 4, 2013. Very nice plane for the family. Its nice to see Pierre Casiraghi accompanying his mother,Princess Caroline to official acts. Well I guess as the Princely couple need to be in various places around Europe they need a mode of transport to get them there and back again quickly. Would love to see how stylish the interior would be. I guess his sisters will get to use it on ocassion as well. I have exactly the same thoughts than you, especially comparing Tatiana-Beatrice. Beatrice is a "front of the stage" person, Tatiana not. Prince Albert and Princess Caroline today, March 20, attended the screening of "La Baie des Anges" at the Grimaldi Forum. Jacques Demy's 1962 film starring Jeanne Moreau and Claude Mann had recently been restored byCiné-Tamaris and La Cinémathèque Française, with the backing of the Franco-American Cultural Fund, Monaco's Audiovisual Archives and the SOGEDA Monaco. Aww,I missed seeing her ruby earrings and matching necklace..she has these jewels for so long now.Elegant as always. I personally think that she's looking more and more like her grandmother,Princess Charlotte. Prince Albert and Princess Caroline have received and honoured Irina Bokova, incumbent Director-General of UNESCO, at the Princely Palace today, March 21. I very much like the way Albert does certain engagements with his sisters/nephews and nieces rather than just Charlene. Caroline's affinity with this organisation make her the appropriate person to accompany the Prince on this occasion. Time to close this thread. Thanks for all your contributions! The new thread can be found here!